Wow! Fellow West Maui Book Club member, Barbara Kerbox, has a current art exhibit at the Hawaiian Village Coffee shop in Kahana Gate Way Shopping Center. 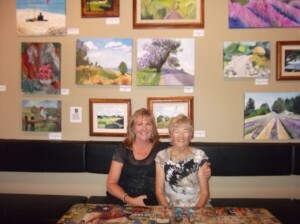 Twenty-six of Barbara’s fabulous paintings are on display! Go, Barbara!!! This entry was posted in WMBC Web Vine. Bookmark the permalink.